Christine Anne Perfect was born on July 12th, 1943, in Grenodd, Lancashire, near Birmingham, England. Her father, Cyril, was a college professor and concert violinist, and mother Beatrice (called Tee) was a medium, a psychic and a faith healer. Her grandfather had played the organ in Westminster Abbey. Coming from such a musical family, Christine was given lessons on the piano at the age of four, but her parents soon realized she was not enjoying it in the least: "Thanks to them, they were wise enough to let me stop, and then I took it up again of my own volition when I was about 11." (Incidentally, she claims that it was difficult growing up with the surname 'Perfect': "My schoolteacher would say to me, 'Well I certainly hope you are, Christine.' It was severe... a lot of people ask me why I still keep my married name, now that I'm no longer married, and the answer is obvious-- because I didn't like the name Perfect! " ) She continued taking classical music lessons until the age of 15, when her 19 year old brother, John (currently an entomologist with the government in England) brought home a Fats Domino songbook-- as she says, it was "Goodbye Schubert-- hello rock n' roll." On one occasion she and a pal sneaked down to London, hoping to impress some talent scouts by playing "Walk, Don't Run" on acoustic guitars before a Shadows concert. Chicken Shack and Fleetwood Mac often ran into each other while playing the same clubs, and for awhile Christine sort of had her eye on the charismatic Peter Green. 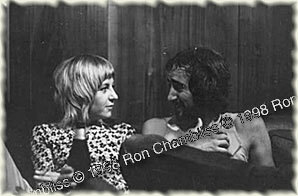 One night, after having a few drinks and a few laughs with her, John McVie asked Chris if she'd care to go out to dinner with him. She had thought he was engaged, but he told her that was all over: "I thought he was devastatingly attractive, but it had never occurred to me to look at him before." 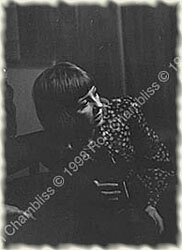 (Chris explains how she began dating John, 34 seconds TrueSpeech)The two courted for awhile, until John went off to America for 6 weeks with Fleetwood Mac, and she didn't hear from him once: "At this point I was really crazy about him, but I didn't know what was going on with him." While playing gigs in Munich with Chicken Shack, she had a strange affair with "a crazy German D.J., who wanted to whisk me off and marry me...I turned him down, and wrote John a big letter." 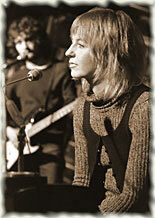 McVie proposed upon his return to England, and the two were married in August 1968. (The night before the wedding she received a call from Peter Green, who was to be their best man, telling her, "You're crazy-- you don't even know this guy!") She went ahead and married John anyway, and they honeymooned in Birmingham before going their separate ways with their respective bands. Both John and Chris spent a lot of time on the road, and the couple rarely saw each other. So, in 1969, Christine announced that she would be "retiring" from the music business to be a housewife. The news that she was leaving the group coincided with the release of Chicken Shack's only big hit, "I'd Rather Go Blind," and that year she was voted Best Female Vocalist in the Melody Maker's readers poll. (She was also awarded the title of having one of the top ten pairs of legs in all of Britain.) She was encouraged to get her own band together and do a brief solo tour: "I wasn't keen on giving up my life of leisure as a housewife, but then I did enjoy being able to earn money independently." The tour came to an untimely end in Nottingham, however, when Christine ran off the stage in tears, overcome by her own imaginary defects-- "Even worse, I had to come back on and finish the set." She also released a solo album, called Christine Perfect, an album that she now feels is "not very representative of me-- I wrote very few songs at that time, and the ones that I did write-- I'd just as soon have them slipped under a carpet somewhere." Thus, her confidence was not in the greatest shape when she was asked to join Fleetwood Mac in 1970. The band was just about to embark on their first tour without Peter Green, and went into a bit of a panic, thinking that their sound wasn't full enough. Since Chris had been an uncredited guest (playing keyboards and singing background vocals, as well as painting the album cover) on Kiln House, and had sat through hours of rehearsals, she knew all the songs anyway, and was invited to join the band: "Ten days later we were playing in New Orleans. I'd never been to America before, except when I visited John one Christmas." She recalls it was a nerve-wracking experience, playing onstage with her favorite band. Thus began her career with Fleetwood Mac. 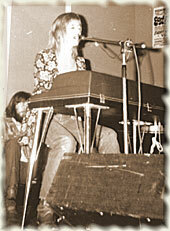 Aside from making major contributions to all albums from 1971 on, Christine was also an important part of the group's stage personality, and was a source of strength and stoicism throughout the many trials and pitfalls that befell the band. However, seeing her husband for nearly 24 hours a day for years began to be a real problem for them, and the drinking on the road didn't help matters: "John is not the most pleasant of people when he's drunk. Very belligerent. I was seeing more Hyde than Jekyll." She says that she and John were very happy for about three years, until the stress of their constant togetherness began to show: "We just saw so much of each other at work, at play and at home that it became very wearing on the relationship." Mick Fleetwood has stated that years after joining the band, when the marriage was under so much strain, Chris wondered if she had really made the right decision, although he doesn't feel that she would go back and do anything differently. According to a book written by Bob Brunning, around 1973, Chris had a 'barely concealed' affair with the group's producer, Martin Birch. For awhile she was pondering leaving the band to make a solo album with him, but this idea was squashed when Birch went back to his wife and the McVies decided to decided to give their rocky marriage another go. While Fleetwood Mac was making Tusk in 1979, Christine got involved with the Beach Boys' drummer, Dennis Wilson, and this tumultuous relationship lasted about 2 years, ending around the time Mirage was released in 1982. In '84, she felt as if she was ready to do a solo project (Nicks, Buckingham and Fleetwood had all done solo efforts by that time). She got a band together, which included George Hawkins and Todd Sharp, and went off to Montreux, Switzerland, to complete a good deal of the work. The album yielded 2 memorable singles, "Love Will Show Us How" and "Got A Hold On Me," and she embarked on a brief solo tour. While making her album she met keyboardist Eddy Quintela, (who was 12 years younger than she,) and the two were married on October 18th, 1986. They wrote many songs together on later Fleetwood Mac albums. In 1986, Chris was asked to do an Elvis Presley song, "Can't Help Falling In Love" for the movie A Fine Mess, and she asked Richard Dashut to act as her producer. He, in turn, said Lindsey would probably love to help out, since he was a huge Elvis fan. 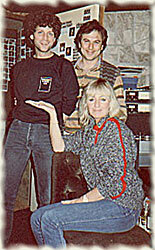 She went on to recruit Mick and John for her rhythm section, and 4/5 of the band found themselves together in the studio and actually enjoying it. They got a hold of Stevie, and the album Tango in the Night was released in 1987. After the departure of Buckingham, FM hired Rick Vito and Billy Burnette and made Behind the Mask in 1990; the album was followed by a world-wide tour. She appeared with the Rumours line-up at Clinton's Inaugural Gala, inviting Clinton and his family to join the band onstage for the finale, and also performed a few days later at the Superbowl half-time show. In 1997, she joined with the rest of the Rumours line-up in a reunion album and tour, and contributed one fabulous new song called "Temporary One", written about her family in the UK. However, halfway through the tour she began to have serious doubts about continuing on with the band and with the tour; as Stevie says, "We spent the next eight weeks trying to change her mind." Her marriage to Eddy was in turmoil (it ended in divorce) and she wanted to go home to England to sort out her life. She did decide to quit touring after the shows in the U.S. were completed, citing exhaustion as the main reason for not wanting to continue. Stevie Nicks had this to say in a June 2001 Sonicnet interview: "She can't do it. She has moved back to England and she is really happy. Chris is 57, she has the rest of her life to live, and she doesn't want to do this anymore. There's really nothing that can be said to her to make her change her mind. She wants her life to be in England, and she wants to be with her family and all her friends. She sold her house, her car and her piano and went to England three years ago, and I haven't seen her since. And it's OK because I understand that she really cannot do this. So I'm not gonna ever ask her again. And she wants us to play. Just because she's not there, she didn't die. She's living a fabulous life. She has a castle with 20 acres of gardens, she has an apartment in London, she knows everybody. And if you went over there and saw her life you'd say, "OK, I understand." It's very lonely on the road. It's especially lonely for the girls. As Christine has said to me many times, 'Stevie, this is your passion. It is not my passion.'" The five members of the Rumours line-up, along with and the band's founder, Peter Green, were inducted into the Rock and Roll Hall of Fame on January 12, 1998 at the Waldorf Astoria Hotel in New York City, and Christine was present for that honor. 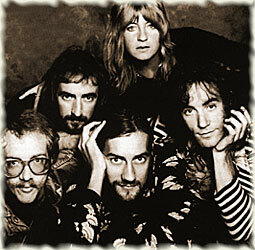 Fleetwood Mac released a new album in 2003, Say You Will, and embarked on a long tour, but Christine McVie did not join them for either endeavor (although she can be heard on the tracks 'Bleed to Love her' and 'Steal Your Heart Away.') She still resides at her house in Kent, enjoys gardening and cooking, and remains close to her two brothers, John and Cyril, as well as her young neice and nephew. She did go and see Fleetwood Mac perform at their last show in London in November 2003, but chose not to make an onstage appearance. We hope to hear more music from Christine in the future, and hope that the present is bringing her all the happiness she so deserves. After appearing onstage with Mick Fleetwood's band in Hawaii in early 2013, Christine thrilled London audiences by reuniting with her former bandmates to sing Don't Stop for two performances in September 2013. Proving that you can never say never, in January 2014 the band's press agent officially announced that Christine was returning to Fleetwood Mac after a 15 year absence.